New Orleans is on high alert! Thankfully not because of a hurricane this time. 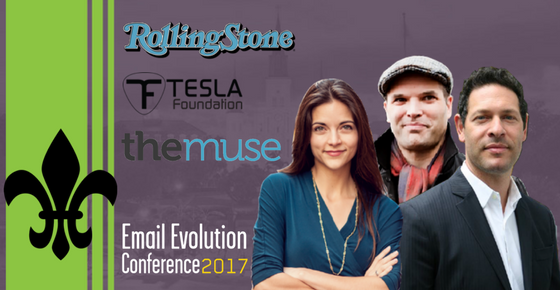 Instead, in just one week a force even more powerful will descend on the Big Easy: nearly 500 email marketers converging for three days of education, networking, insight and fun at the 10th Email Evolution Conference. The Email Experience Council (EEC)'s annual event delivers the latest and greatest in everything email – from technology and process solutions, to creative, content, real life success stories and case studies, strategy, state-of-the-channel updates and more. Returning to the Hilton Riverside New Orleans for the second year running, Email Evolution is the go-to conference for mid- and senior level digital and email marketing professionals seeking ways to enhance campaign and channel performance, take their programs to the next level, or stay abreast of innovations, trends and cutting-edge technology. Its invigorating blend of exclusive content, expert advice, inspiring keynotes and exclusive networking delivers a transformational experience that keeps attendees coming back, and helps big brands cost-effectively retain their customers to keep them loyal as well. Never miss a post! Join for the latest news on email marketing innovations, tips and exclusive event discounts delivered straight to your inbox. Engage Karen by the hour or minute with Clarity. Clarity is a marketplace that connects entrepreneurs with top advisors & industry experts to get strategic advice, industry insight, marketing help or learn a specialized skill to help them grow their business. Sign up for email and get new blog posts, breaking industry news, event discounts, the latest free email tools and more!